<Cross-posted from Drew’s Views>Continuing in my Boba Fett description project, the second time Boba Fett appeared in either television or movies is in “The Empire Strikes Back” (Star Wars Episode V). This appearance is perhaps his most famous appearance, from which most people know him and were introduced to him (since most people have not (or do not want to) watched his first appearance in the atrocious Holiday Special). He appears many different times in “The Empire Strikes Back”, which makes this “popular introduction” an interesting one. The first time we see him, he is part of a handful of bounty hunters assembled on the deck of the Super Star Destroyer, whereby Admiral Piett says to another Imperial naval officer: “Bounty hunters – we don’t need that/their scum.” We already sense that this handful of bounty hunters are not the most highly-desired folks from the perspective of imperial soldiers. That Darth Vader is addressing them indicates not only the high-level importance of the mission, but also that these bounty hunters may be the best [who will work for bounties from the Empire]. 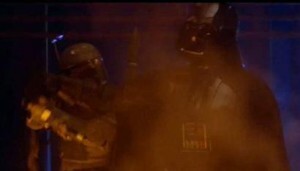 When Darth Vader says to capture them “by any methods necessary”, he turns specifically to Boba Fett, as if they’ve had a past history with a particular problem: “I want them alive; no disintegration.” Clearly, they’ve had a history where Boba Fett has disintegrated past missions (Fett follows up with a statement of compliance: “As you wish”). Boba Fett then intelligently follows the Millenium Falcon in his ship, also realizing that they would take a road less-travelled. 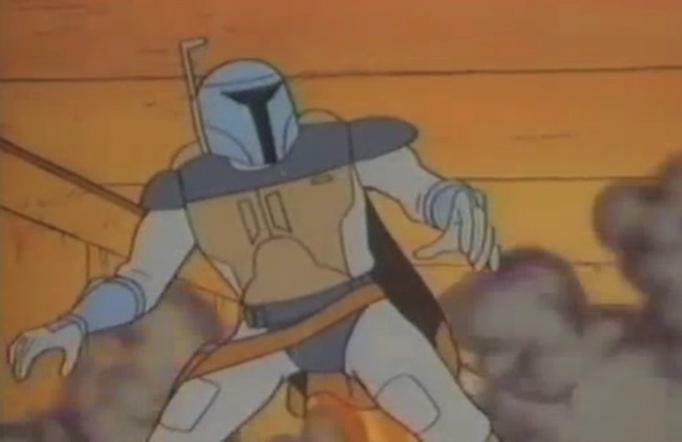 This shows that Fett possibly could have realized that for a ship that large to escape the Empire, it must be using an usual method of departing, which indicates that Fett has a considerable degree of experience and smarts. He follows them to Cloud City, alerting Darth Vader to their whereabouts. We see Darth Vader welcoming the folks of the Millenium Falcon to dine with him, with Boba Fett walking up behind him, toting his rifle, replete with the sound of spurs on his shoes – he clearly intends for people to hear him coming. He doesn’t care if people know he’s around! 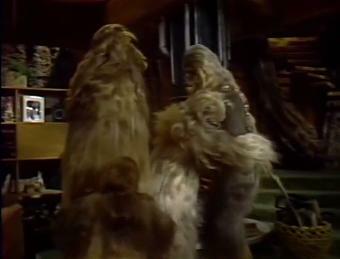 Next, we see Han Solo being tested to be Carbon-frozen and Boba Fett is outside the room, when Darth Vader emerges, he tells Fett he can take him to Jabba the Hutt, but Fett admonishes him “He’s no good to me dead.” What’s fascinating is that Fett can speak sharply to Lord Vader and get away with it (as opposed to Lando Calrissian’s dialogue with Vader that immediately follows)! When they are gathered for the carbon-freezing, Fett asks Vader “What if he doesn’t survive? 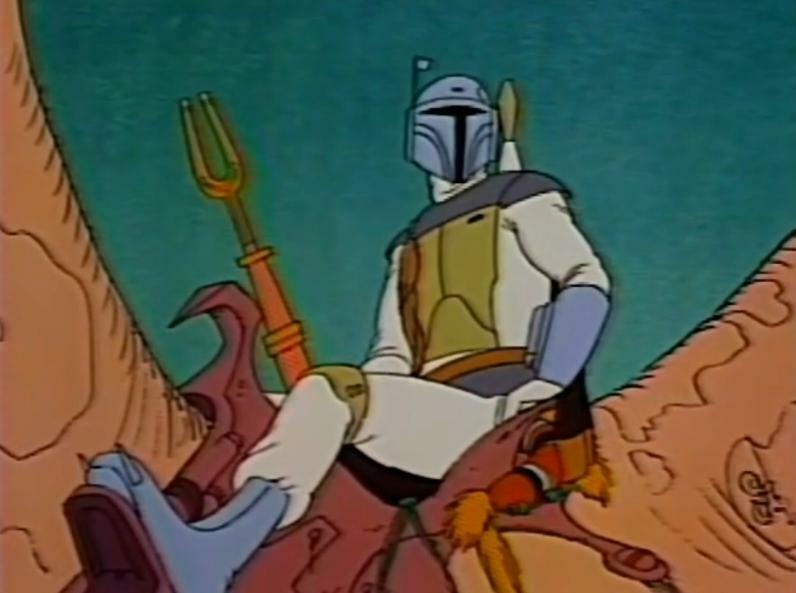 He’s worth a lot to me.” Fett clearly cares about receiving his bounty. However, when Vader responds “The Empire will compensate you if he dies”, it is interesting to notice that Vader respects Fett enough to not totally shrug him off and offer to properly remunerate him. When Chewbacca throws a couple of Storm Troopers over and grabs a rifle, Fett lifts up his rifle to aim and shoot, yet Vader makes him lower it. It’s not clear why Fett is willing to shoot here: there are multiple possibilities, but the one that seems most likely to me is that he wants to make sure nothing happens to Han Solo, his bounty, so he can deliver him to Jabba the Hutt. After healthy carbonite freeze, Vader informs Fett: “He’s all yours, bounty hunter”, with Fett bowing to Vader, as if to say “It’s been nice doing business with you again.” They’ve been doing business for a while – they’ve had previous business dealings and this is just another one. We next see Boba Fett, rifle at the ready, escorting the carbonite frozen Han Solo with a couple of Storm Troopers and a couple of Imperial naval soldiers. We once again hear Fett’s spurs while walking, indicating his presence. We then see Luke Skywalker, who starts to follow them, but hangs back, until R2-D2 makes some noises, which causes Fett to come back – he was at the front of the line(! ), so he must have doubled back really quickly! – to shoot at Luke. After getting off a couple of shots, he then hustles back to his ship for the loading. At first, I was puzzled why Fett would run away from this gun fight: was he afraid of a lengthy shoot-out and losing? It could also be that he was more worried with getting his cargo that was worth a lot of money onto his ship and flying away off the planet and getting it to Jabba the Hutt for the cash. Then, he loads up his ship, rifle in hand, clearly aware – after having engaged Luke Skywalker in shooting – that he is being threatened with potential attackers and he needs to make sure that his bounty is loaded up quickly, so he can scoot out of there as soon as possible. When he does fly away, he makes it off the platform just in time, as Princess Leia and Chewbacca are shooting at him (of course, this is a leitmotif of Star Wars: important ships departing as people are shooting at them). We see that Boba Fett is a bounty hunter, who may not be liked by the Empire, but seen as a necessary way of achieving the Empire’s aims. He cleverly is able to follow and track down the Millenium Falcon, leading Darth Vader and the Storm Troopers there. He and Darth Vader clearly have done business before, although not liking how Fett can sometime obliterate his bounties. Vader respects Fett, which certainly stands out, and Vader doesn’t want to push him away. Walking with his spurs, making noises every time he walks, certainly indicates he doesn’t care who knows he’s around – he’s ready to rumble! He also is very swift, as he ran back to shoot at Luke Skywalker after hearing R2-D2, so he can be very alert. Lastly, he cares very much about getting his bounty – cash is important to him.